In the past only experienced routefinders and bushwhackers visited these hills. Trails were spotty. Today, trails are still intermittent, but all routes are well blazed by X and friends. Look for cut branches, occasional flagging and cairns. 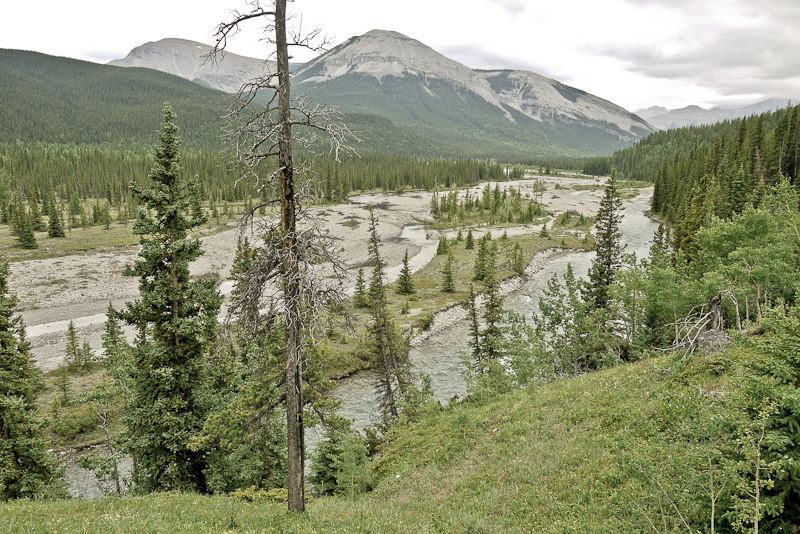 The two loops described below are adapted from Kananaskis Country Trail Guide Vol. 2. using the same trail numbers. An interesting day loop taking in the three tops. Drive to the far Cobble Flats trailhead and park. From the end loop, a grassy road heads uphill to a junction. Keep right. (junction not marked on map), then turn next right. The road winds uphill to its high point in a clearing at 543332. This road is marked as 26B and 27 A on the map. Turn right at a flagged T-junction onto a slabby, then grassy track. After a trail joins in from the left at a cairn, the track winds uphill through open forest, and appears to end in a flat strip of meadow. At the far end of the meadow steer 11 o’clock (cairn, blazed trees) on a trail that climbs through a tiny rockband. At the top turn right and follow the summit ridge to West Top at 543338 (cairn). 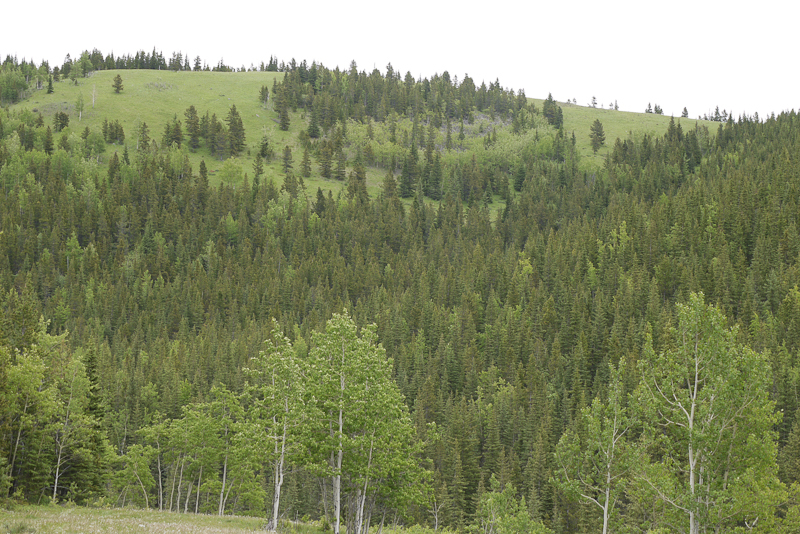 While it is open, only the tops of mountains can be seen above the surrounding pines. At the cairn, follow the blazed trail northeasterly down to a col. Climb to a cairn, then continue uphill to a grassy ridge. Walk right a way, then head down left into the trees. From the bottom of the hill at the edge of meadows the blazed trail turns left. In sight ahead is the centre hill. Either make a beeline through meadow, or follow the blazed trail to a T-junction, where you turn right through a few trees to gain the top. At 1820 m (5970 ft.), the centre hill’s summit is marked by a boulder, a cairn and a shade tree shown on the contents page of the trail guide. It’s a nice viewpoint, but for the very best view carry on to the east hill, which is close at hand. 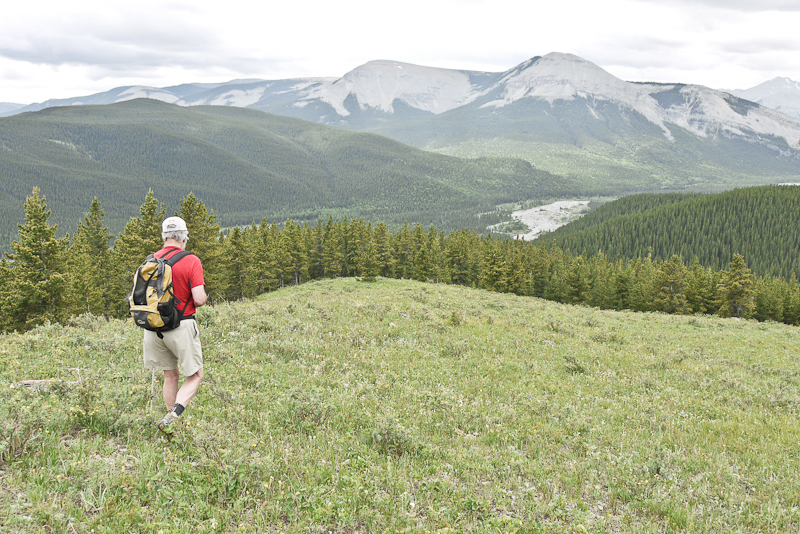 Heading east, the route descends to an aspen col, then climbs a grass ridge to east hill at 1814 m (5,950 ft.). From flowery meadows are panoramic views taking in Quirk Ridge, Quirk Creek, Forgetmenot Ridge and the foursome of Banded Peak, Outlaw, Cornwall and Glasgow seen through the gap to the west. In the other direction view the other two hills you’ve just walked over. Head down the well-defined, grassy south ridge. 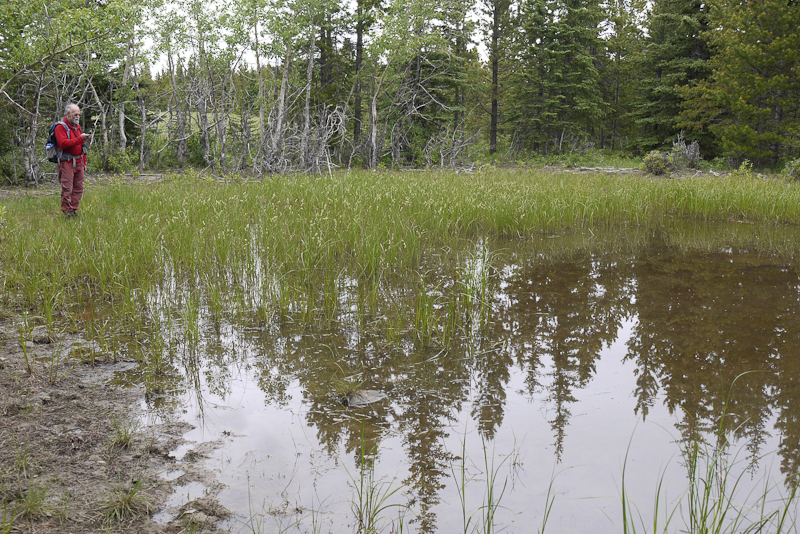 Gradually the meadow breaks up, the trail winding through glades and between trees to the bank of a small creek. It follows this down a short way, then veers off left and, very distinct here, descends more steeply to #26A at 556333.Turn right and head back 2 km to Cobble Flats. Loop 2 from Rainy Summit. 6.4 km. The shortest, fastest access to West Hill with little height gain. 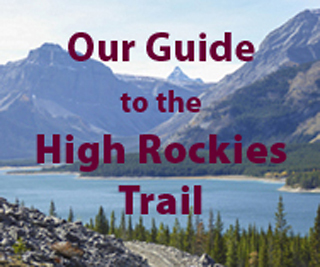 A suggested 6.4 km loop is to visit all three tops then return via 27C and the Rainy Creek pack trail to Rainy Summit. From Rainy Summit lay-by, cross the highway and walk 200 m north to where the old highway twice removed (track) leaves the top of the embankment at 539334 (cairn). Follow the old road to the right (marked as 27B on the map). In 200 m, at a cairn, turn left onto a faint blazed trail that cuts across to the usual grassy track at a small cairn. Turn left. Head up to the three tops as described for Loop 1. If you visit the East Hill, return to Centre Hill. Start from the T-junction below Centre Hill and descend northwest, then east to meadows near the pond. Walk north along the open ridge, in places crammed with camas lilies, to its far end — a terrific viewpoint for the east side of Powderface Ridge. Descend the west slope on steep grass to the right of a tree island, veering left as you near treeline to find a blazed tree with red flagging tied around it. This indicates the start of the forest trail. The trails zigs down, then on easy terrain goes straight to meet Rainy Creek pack trail at 543347 (blazed, flagged tree). Turn left and follow the pack trail, numbered 26B to Rainy Summit, thus completing Loop 2. Loop 2 can be shortened if you use two vehicles, leaving one at Rainy Creek lay-by on the way up the road. From the pack trail, a blazed, flagged trail heads right to the banktop, then descends diagonally left down two tiers of grassy banks to Rainy Creek. The crossing is one long step between grassy banks. On the far side head left a short way, then turn up the steep bank in the aspens. Part way up at a Y-junction go right. The trail soon flattens in forest, then makes one last brief climb to the banktop trail. (cairn, blazed and flagged tree). Turn left and follow the banktop trail — listen for the waterfall — to a strip of grass above the southwest fork. Turn right for Hwy. 66 and the lay-by.